Yesterday we recommended the Beaba Babycook Baby Food Maker to make homemade baby food. This upcoming Sunday we will also review The First Years Babypro All In One Baby Food Maker . There are many advantages to making homemade baby food. You can control the ingredients, such as using only organic produce. You don’t add preservatives or unnecessary additives, like artificial colorings, that are commonly found in commercially made baby foods. It is also cheaper to prepare homemade baby food, even when it has organic and high quality ingredients. The “Four Day Wait Rule” is an an easy way to check for food allergies or sensitivities. Introduce new foods, one food at a time, and at a space of four days apart. For example, introduce baby to avocado on Monday and then wait until Thursday to introduce another food. When you introduce a new food over the course of several days, you are better able to determine exactly how the baby is reacting to that food. It is very important to follow the “Four Day Wait Rule” when introducing a baby to new solid foods. This is most important if the baby’s family members have a history of food allergies. After each new food, watch for any allergic reactions such as diarrhea, rash, or vomiting. If any of these occur, stop using the new food and consult with the child’s doctor. According to the American Academy of Pediatrics single-grain cereals are usually the first solid food to introduce to infants at six-months-old. Baby cereals are available premixed in individual containers or dry, to which you can add breast milk, formula, or water. Premixed baby cereals are convenient, while dry cereals are richer in iron and allow you to control the thickness of the cereal. Whichever type of cereal you use, make sure that it is made for babies because these cereals contain extra nutrients babies need at this age. Give the baby just one tablespoon portion of food you made to taste. If the baby has just started eating solid foods, it will be rather difficult for her to eat even half of the portion. Remember, that it is a new experience for the baby so don’t force baby to eat. When the baby gets older you will increase portion sizes. Do you make homemade baby food or buy it at the store? We do both. Just jars from store for when we are out. But at home (most of the time) serve homemade organic veggies and frutis. I am so frustrated with the process the family is following for feeding the baby. They do everything differently then Americans. All recent advice from American Academy of Pediatricians is being ignored by the parents even after I show them the new advice. Very frustrating. Meanwhile the baby is getting bowel problems forcing too complex foods too early, frustrating beyond belief. How do you I share my concerns without being rude? Dear anonymous above:The nutrition rules have changed drastically this year. The parents should be delighted to have a nanny that cares enough to learn the current recommendations. Don't get upset. Share the info with them, then follow their directions. In the big picture, they are the parents. You should always share your knowledge respectfully then don't worry if they don't listen. You did all you could do. Please follow the four day wait rule. We were always taught one week but I guess four days is enough. I once cared for a baby with celiac disease (can't have glutten allerigic to wheat). Very important to record the reactions to new foods! I've had the same issue anonymous. I don't know why Americans rush their kids so fast. 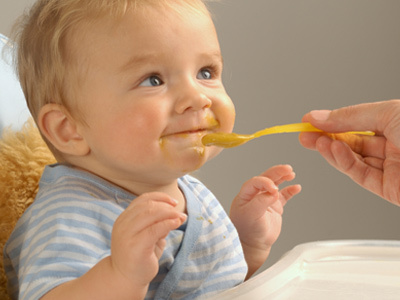 In Portugal we never feed babies solids until at least 6 months then it's much slower. No meat, milk, eggs or wheat until after 1 year old. I've got similar issue. Baby is 6 months old and mom wants to start finger foods and meats???!! He doesn't even have teeth? I'm completely confused why push so hard when pediatricians say just fruits, veggies and rice at this age? We use the Beaba and make own baby food for now. Eventually and soon I see us outgrowing it. The Beaba is too small and the baby is eating so much already. I hope to use store bought jars once we move up to meats. I haven't a clue how to puree meats.